Premium quality vacuum pump oil for single and dual stage rotary pumps. Extra refined for increased lubrication, enhanced sealing and reduced back streaming. 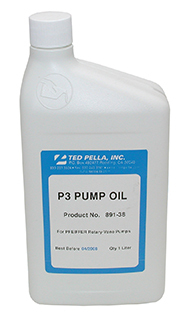 Excellent oil for rotary backing pumps on high vacuum systems, electron microscopes and mass spectrometers. 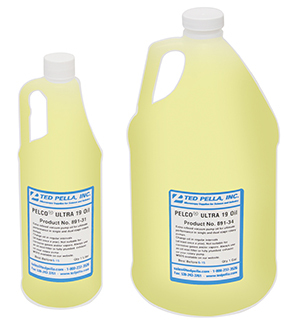 PELCO® Ultra 19 vacuum pump oil is suitable for our VRP, RVP and VRI Rotary Vane Pumps. Compatible with rotary vane pumps from Edwards, Adixen, Alcatel, Varian, Agilent, Leybold, Oerlikon, Ulvac, Sargent-Welch, Ilmvac and other brands. Fully comparable with Edwards Ultragrade 19 and Inland 19 Ultra rotary pump oil. Great cost savings compared to more expensive brand products. Indefinite shelf life when stored in unopened container at ambient temperatures out of direct sunlight. Mineral oil derivative ideally suited for mechanical rotary vacuum pumps. Light end fractions are removed through molecular distillation resulting in lower vapor pressures and reduced backstreaming compared to undistilled refinery products. Offers reduced maintenance costs, longer fluid life and cooler running. Suitable for single and dual rotary vane pumps from VRL, Edwards, Alcatel, Adixen, Varian, Agilent, Leybold, Oerlikon, Sargent-Welch, Ulvac, Ilmvac, and other brands. Indefinite shelf life when stored in unopened container at ambient temperatures out of direct sunlight. Clear, monograde oil that has the correct viscosity for Pfeiffer Rotary vacuum pumps, excellent sealing and lubrication properties, low vapor pressure and reduced back streaming. Used also for Prod. No. 7010 and 7010-220 Rotary Pumps. Indefinite shelf life when stored in unopened container at ambient temperatures out of direct sunlight. 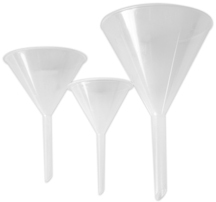 Polypropylene funnels; useful when filling a vacuum pump with oil or draining the oil from the pumps. Lightweight and durable. Set of three with 75, 150 and 500ml capacity. Heavyweight cotton shop cleaning towels are highly absorbent and economical. Preferred rags for cleaning oils and grease or cleaning large areas. 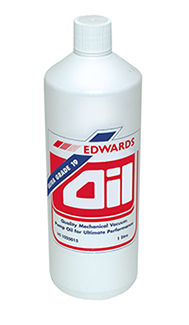 Ideal for cleaning up after oil changes on vacuum pumps, repairs or when oil drips out of the mist filter. 14% recycled cotton yarn blended with 86% new cotton. These blue cotton rags are pre-washed, soft, serged edges, low lint, heavyweight quality. Size is approximately 14" x 14" after washing. Sold in packs of 10. Krytox® Perfluorinated Polyether (PFPE) inert vacuum pump fluid for corrosive and oxygen applications. Chemically inert pumping fluid with excellent lubrication properties. Used in chemical resistant pumps as used in plasma cleaning systems. Operates efficiently, economically and safely in diffusion pumps in properly designed systems to produce ultra-high vacuums in the 10-10 torr range. A wide liquid range, low vapor pressure and balance of properties make it an ideal working fluid in diffusion pumps. Extremely low vapor pressure results in low ultimate pressures. The vapor pressure of Santovac® 5 at 25°C is 4 x 10-10 as determined by extrapolation from higher temperature data. 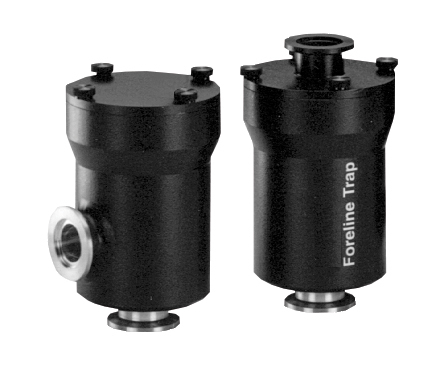 Together with low backstreaming characteristics, 10-10 torr vacuums can be obtained in well designed systems without the use of nitrogen traps. Shelf	life	in	sealed	amber bottle 30-40 years when stored at ambient temperatures. Low backstreaming. 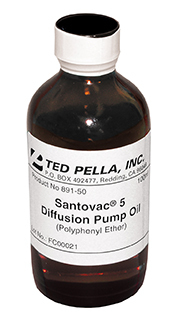 Santovac® 5 pump fluid can be used for electronic component manufacture, laboratory, analytical, instrument and research applications. Santovac® 5 offers unusually high thermal and oxidation stability, with isoteniscope tests showing thermal stability at 465°C (870°F). May discolor with use but this does not affect its operation. Oxidation and corrosion tests, and field experience have shown that Santovac® 5 has little tendency to increase in viscosity during use. 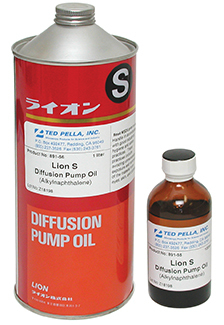 Lion S diffusion pump oil is a high quality alkyl naphthalene based diffusion pump oil, especially developed for applications such as electron microscopes, mass spectrometers and small vacuum systems. Recommended for TEMs and SEMs made by Hitachi, JEOL and ISI/ABT/Topcon equipped with a diffusion pump. No need for lower grade substitutes, this is the original LION S diffusion pump oil, manufactured by the Lion Corporation, Japan. It has been and is still used in diffusion pumps used in instruments manufactured in Japan. Lion S diffusion oil has a high resistance against oxidation and works well with small and medium size diffusion pumps. 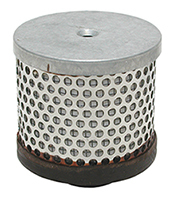 Filter for removing oil mist from vacuum pump exhaust in Prod. No. 7010, 7010-220, 91020 and 91020-230 Rotary Pumps or other rotary vane pump with NW/KF 16 output flange, such as the Pfeiffer Duo 2.5 and Uno 5.0 vacuum pumps. Creates a cleaner work environment for operators and surrounding equipment. Connection: 1/4" male NPT thread. With Product No. 92465-16 adapter, fits VRI-2, VRI-4, VRI-8. Permits discharge into clean work areas. Return collected oil to sump or discard. Rugged construction, simple installation. For non-hazardous, non-corrosive applications. Fits on VRP 100-3.5, VRP-8, Edwards RV5, or similar. Connection: 1/2" male NPT thread. Color of filter material may vary from white to yellow. 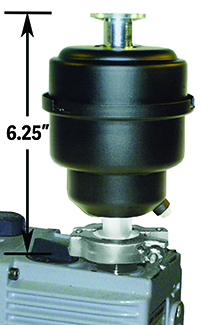 Compact Oil Mist Eliminator with KF25 connection and 1/8" drain plug. Max flow rate 10 CFM (5 ltr/sec or 16m³/hr (suitable for #92080, 92081, 92078, 92079, 92082, 92035 and 92035-220). Baked enamel steel housing, ø89 x 127mm H (ø3.5" x 5" H). Use replacement filter #92066-10. For rotary vacuum pumps it is recommended that they should be vented outside the room or to a laboratory exhaust hood to prevent indoor air contamination. 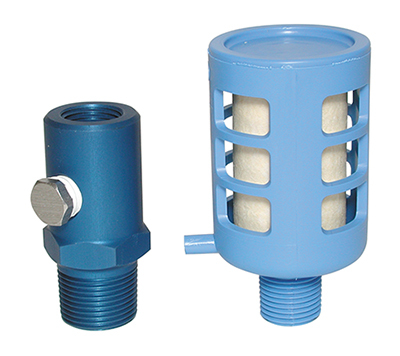 This two-stage vacuum pump exhaust filter kit enables venting rotary vacuum pumps in rooms where an outside line is either not practical or possible. 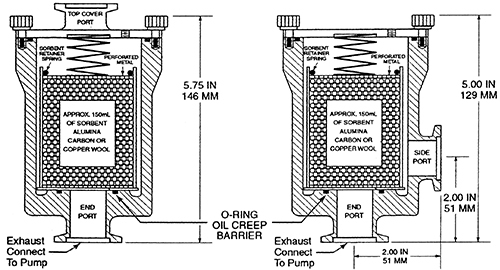 The two stage filters contains a replaceable oil mist eliminator element to trap vacuum oil and a replaceable activated charcoal element for the lighter hydrocarbon fractions. It is recommended that both filters are replaced on a regular basis. For application such as electron microscopes and mass spectrometers, the oil mist filters (#92066-10) need to be replaced every 4-6 months and the final activated charcoal filter (#92068-20) once a month. Rated for vacuum pumps up to 10 CFM (5 ltr/sec or 16m³/hr) (suitable for #92080, 92081, 92082, 92078, 92079, 92035 and 92035-220). The activated alumina sorbent is used in foreline traps to prevent backstreaming from rotary pumps or to shield vacuum gauges from contamination. PELCO® Activated Alumina Sorbent can be used in foreline traps from VRL, BOC-Edwards, Alcatel/Adixen, Varian, Leybold, Sargent-Welch, Ulvac and other brands. The small pores (2-50nm) and the non uniform pore distribution in the PELCO® Activated Alumina Sorbent provide the large surface area of 350 m²/gram. 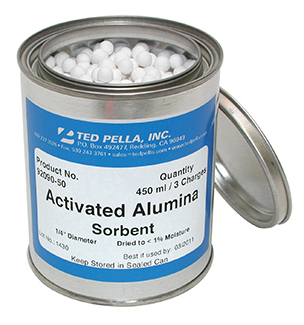 With this large internal surface area, the activated alumina sorbent attracts and holds gas molecules to which it is exposed. PELCO® Activated Alumina Sorbent is activated at 350°C (662°F) to less than 1% water and it is capable of holding 43% water (by weight) or in the foreline trap application, oil. 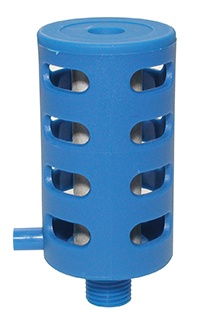 The relatively uniform 1/4" diameter size makes it ideally suited for charging perforated mesh canisters as used in foreline traps. 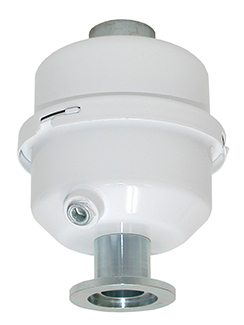 Also recommended for drying gases and refrigerants and for applications where extremely low dew points are desirable. Packed in a 450ml metal can with sealed lid.